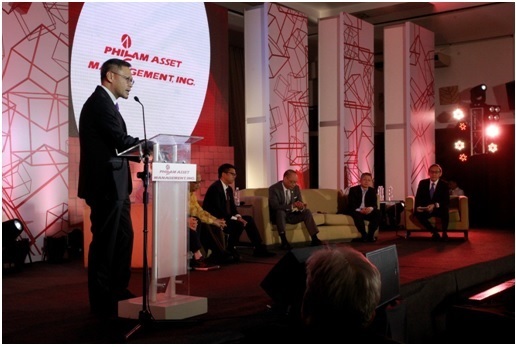 (Left to right) Philam Asset Management (PAMI) CEO and President- Eric S. Lustre, AIA Head of Investment Strategyand Investment Advisory- Kevin Ng, Philam Life Head of Fixed Income and Corporate Finance Vincent Daffon, Writer and Economist- Bernardo Villegas, Secretary of Budget and Management- Benjamin Diokno, PAMI Head of Investments Eduardo “Junie” Banaag Jr., and The Asset Magazine Editor-in-chief Daniel Yu. 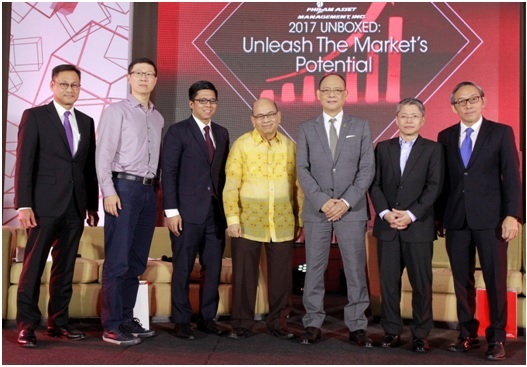 Philam Asset Management, Inc. (PAMI) in partnership with The Asset Magazine, recently held their first Economic Outlook for the year, entitled “2017 Unboxed: Unleash the Market’s Potential” at the Blue Leaf Events Pavilion in Taguig City on January 18. With over 200 PAMI distributors and clients in attendance, the event brought together Secretary of Budget and Management Mr. Benjamin Diokno, famed writer and economist Bernardo Villegas, AIA Head of Investment Strategy and Investment Advisory Kevin Ng, PAMI Head of Investments Eduardo Banaag, and Philam LifeHead of Fixed Income and Corporate Finance Vincent Daffonto share their economic outlook for the year. Kevin Ng covered Global Macroeconomy with key points on global economic growth specifically the US, China, and Europe while Secretary Diokno spoke about infrastructure development, human capital development, competitive tax regime, and plans to lower the cost of doing business. He presented Php 8 trillion to Php9 trillion spending on public infrastructure from 2017 to 2022 which is projected to generate 700,000 jobs annually in the medium term. Sec. Diokno also presented the goal to achieve high-middle income status by 2022 and initiatives to reduce red tape with Project Repeal. Dr. Bernardo Villegas, on the other hand, shared his insights on the growth of emerging markets andthe Asian economic and consumer trends. He enumerated engines that will drive the Philippine economic growth such as young population, BPO industry, Infrastructure, Domestic Tourism, Overseas Filipino Workers (OFWs), Public-Private Partnerships, Agriculture, and Manufacturing. He foresees a maximum economic growth rate of 8% for the Philippines.